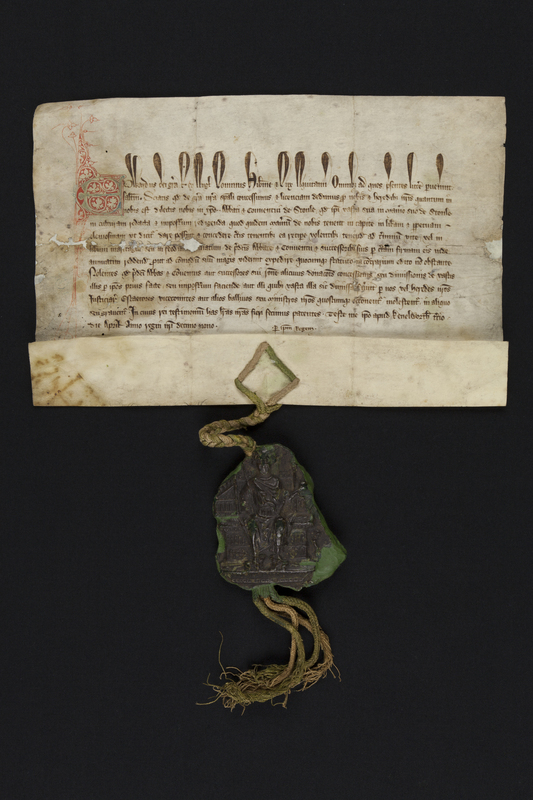 This is an image of the Charter of King Edward I from 1291 which grants specific property rights to the monks at Stoneleigh Abbey, near Stratford-upon-Avon. The green wax seal impression is attached to the parchment document by a silk cord. Seals were used by monarchs, clergymen, aristocracy and merchants throughout Europe in the Elizabethan period to authorise important documents. Family or private seals were also commonly used to finalise and seal letters. For important documents, security was the main concern. Without a seal, a document was neither complete nor safe from prying eyes. Documents were either tied together with ribbon and sealed, or a strip of paper was cut from the letter and sealed onto the rest of the document. For a document to be official, it had to be sealed. Seals had distinctive features so that they could not be easily forged. They often had initials, a motto, or a heraldic design. The seal moulds were made from copper, bronze and sometimes lead, stone or slate. The seals could be attached to wooden or metal handles, or to rings and pendants. To use the seal, hot wax was poured onto the document and impressed with the seal. Royal seals, such as the one used by Edward I, were impressed onto both sides of the wax. It is mistakenly believed that the Magna Carta (1215) was signed by King John. In actual fact, the document was sealed by him, thereby authorising the charter. Edward I, whose seal you see here, was the grandson of King John. In the last two lines, Shylock compares Graziano’s wit to a damaged house, saying that it will fall down if he doesn’t repair it: If Graziano doesn’t make an effort to think of more intelligent comments now, he will become more and more stupid as time goes by. By referring to the seal on his bond, Shylock is affirming the irrevocable and official status of seals on documents. Can you think of more uses of seals or images of sealing in Shakespeare’s works? This entry was posted in Uncategorized and tagged Wax Seals.